Georgia governor candidate Brian Kemp and James J. Stachowiak, a man who has in the past has threatened Kemp’s political rival, and fellow governor candidate, Stacey Abrams’, campaign. In late September, The Root ran a story about a campaign event held by Democratic gubernatorial nominee Stacey Abrams in Augusta, Ga.
Here’s what we wrote at the time. This is a pretty smart campaign stop—she’s tied with Secretary of State and Republican nominee Brian Kemp less than two months from Election Day and African-American women make up 40 percent of women in the army. Everything was going great until four men and one woman, members of the Nationalist Liberty Union, a white nationalist hate group, decided to crash the party by protesting in favor of Confederate monuments and flashing “Kemp for Governor” signs. These aren’t your run-of-the-mill Georgia racists that might end up showing their asses (literally) in a Sasha Baron Cohen skit; these men are thugs, felons and terrorist sympathizers. One of the merry band of bigots that came to the event to harass and threaten Abrams was James J. Stachowiak, a multiple convicted felon who regularly posts videos instructing his viewers to shoot black people on site. Despite having never actually served in the U.S. military, James took it upon himself to lecture black women veterans about their responsibilities to the United States. Only through the grace of Jesus, Moses, Buddha, Mohammed (remember that one) and the ghost of beatdowns past, present and future was his nonserving-self allowed to walk out of that event with his teeth intact. If there was a Purple Heart for patience those women earned it that day. There was very little coverage of James Stachowiak and the Nationalist Liberty Union’s threats at the Stacey Abrams campaign event. Despite them brandishing “Brian Kemp for Governor” signs, the Kemp campaign never disavowed the group nor did any of the major media outlets in Augusta or Atlanta chastise the Republican nominee for not doing so. Now let’s fast forward a month from that event in Augusta. September 26: Rep. Kia Morris resigns as the only black elected official in Vermont after sustained racist threats and harassment. October 23: Georgia Republican gubernatorial nominee Brian Kemp (who also oversees the governor’s election as Secretary of State) is caught on tape complaining that minorities might “Exercise their right to vote” in the governor’s race. October 23: President Donald Trump declares himself a white nationalist on national television during a rally in Houston for his new best friend Senator Ted Cruz. October 24: Barack and Michelle Obama, Cory Booker, Eric Holder and Maxine Waters all receive pipe bombs in the mail from a racist Trump supporter (do we need to really specify that anymore?) Cesar Sayoc who is captured just days later. Unharmed. October 24: 51-year-old, white male Gregory Bush goes on a shooting spree in a Kentucky grocery store, killing two African Americans, allegedly sparing white people by declaring “Whites don’t shoot whites.” He planned on targeting a nearby black church had he not been apprehended. Alive of course. October 27: At least 11 people are killed in a Pittsburgh synagogue and Robert D. Bowers, 46, the man charged with the killings, is revealed to have antisemitic views, reportedly shouting them during the shooting. You see where this is headed right? As a wave of white nationalist violence, that endangers people of all races, sweeps the country, some politicians still want to play footsie with the next Cesar Syoc or Gregory Bush for votes or to intimidate minority candidates. 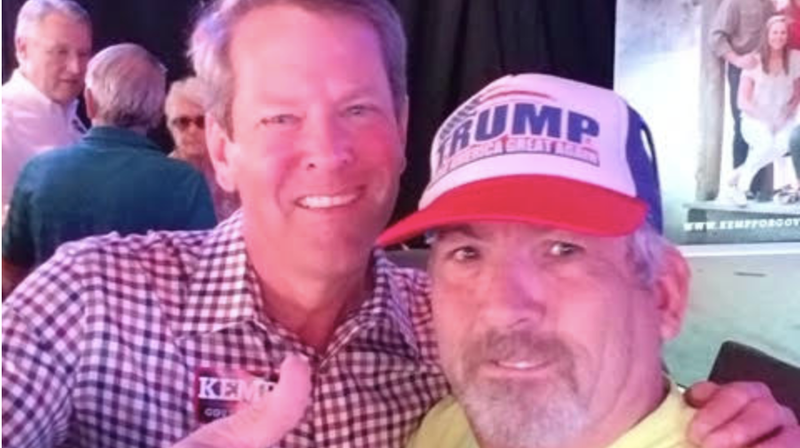 Which might explain why a picture surfaced on Friday of Brian Kemp taking selfies with James Stachowiak at a campaign event in Augusta, Ga. in early October. Stachowiak streamed a 25-minute video of himself at the Wild Wing Cafe campaign event wearing a shirt that says, “Allah is not God and Mohammed is not his messenger.” At about the 17:36 mark on his Periscope, Stachowiak takes a selfie with Kemp. There’s a lot to unpack here, not just about Kemp, but the overall governor’s race in Georgia. This campaign is still essentially tied; every poll has had Kemp and Abrams tied or him with a 2 percent lead over the last two months. That means any event and scandal could tip the scales of this race. However, this photo is not what political folks would call an October surprise. An October surprise is finding out George W. Bush had DUI right before the 2000 presidential election. An October surprise is the Access Hollywood tape and Wikileaks dropping DNC emails on the same day just weeks before the 2016 election. An October surprise would be Linus finally seeing the Great Pumpkin. It is NOT an October surprise for a gubernatorial candidate to be happily taking selfies with a white nationalist and terrorist sympathizer at a Wild Wings. It’s not cute, it’s not politics as usual, it’s not strategic, it’s dangerous—and voters in Georgia need to realize that. It’s highly unlikely that nobody in the Augusta office of the Brian Kemp for Governor campaign knew who James Stachowiak was. They let him into the event and had no problem with him posing with Kemp. Even if you give the Republicans the benefit of the doubt, and nobody knew who Stachowiak was, Brian Kemp was perfectly comfortable taking a picture with a man wearing a blatantly anti-Muslim shirt at a publicized campaign event. Why? Because Brian Kemp shares Stachowiak’s values. Even after the photo surfaced and Georgia CAIR (Council on America Islamic Relations) and other organizations throughout Georgia asked Brian Kemp to condemn Stachowiak and his beliefs— he didn’t. This is the point in the story where we’re supposed to wring our hands and get indignant about what a terrible guy Brian Kemp is and how hate is bad, etc., etc. That part is obvious. From his voter suppression, to his support for Brett Kavanaugh to his poor taste in wing restaurants (who has campaign events at Wild Wings Cafe when you’ve got a Zaxby’s on every corner in Georgia? ), Brian Kemp is not Georgia’s best choice for governor. However, now you have to view Brain Kemp’s selfie in the context of what has been happening in this country over the last month. Brian Kemp sympathizes with terrorists. James Stachowiak is a terrorist. He’s identified his targets, he has repeated over and over on social media what he intends to do, and he just got tacit approval from Brian Kemp. “Brian Kemp stands against hatred,” said his Republican campaign spokesman Ryan Mahoney to the Atlanta Journal-Constitution Saturday. I’d say that picture shows Brian Kemp stands very comfortably with hatred. “He believes we should treat all people with respect,” Mahoney continued in the same interview. Except Kemp didn’t condemn the Nationalist Liberty Union for threatening Stacey Abrams in his name, and it’s pretty clear Brian Kemp doesn’t respect voters, sexual assault victims, Latinos, teenage boys, Muslims, veterans and lots of other people. Think this is hyperbole? Look around the country, just this week alone. You think a Charlottesville-style attack can’t happen in Macon, Ga.? You think the Piggly Wiggly in Columbus, Ga. is any safer than the Kroger that just got shot up in Kentucky? The lesson of the Trump era is that white nationalists aren’t satisfied if men like Brian Kemp get elected, they’re just encouraged to engage in higher profile threats and violence. When James Stachowiak moves from online threats to real-world violence, just like all of these other men this week, what will Brian Kemp have to say then? Nothing. Just like he’s saying nothing right now. Yes, the Georgia election has always been about health care, voting rights and the economy, but thanks to Brian Kemp’s photo, the choice is even clearer. A vote for Brian Kemp is a vote for a Trump-style politician who will roll out the red carpet to terrorists then play dumb when Georgians have to reap the violence that he sowed for a few extra votes. We’re way past October surprises; this election is now a choice between Democracy and terror.